Hà Nội has always been famous for its traditional dishes, which, though often made from ordinary ingredients, are justly famous for their subtlety and delicious flavors. 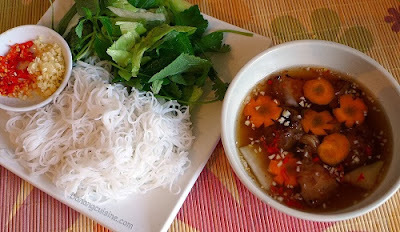 In The Tale of Kiều, Nguyễn Du called them thói trần – the precious things and delicious dishes of each season, or more precisely, of every different weather pattern in each season. Some dishes and drinks are more often served at particular times of the year: glutinous rice liquor in the fifth month of the lunar calendar, trôi (small round sticky rice cake), chay (round sticky rice cake eaten with sweet porridge) in the third month, bánh nướng (baked pie), bánh dẻo (sticky rice cake with filling) in the eighth month, and sugar-coated lotus seeds during the Tết holiday. Most of these foods cost very little and taste wonderful, making them popular with rich and poor alike. During its 30-year war, Việt Nam had to face more than one period of grave difficulty and hunger. Many people conserved food in an effort to supply the front. Many of Hà Nội’s most famous dishes nearly fell into oblivion. This is also the time of the State subsidy system in North Việt Nam. Under this system, food was strictly rationed to insure that everyone ad enough to survive. Wartime conditions also posed great difficulties for Việt Nam’s agriculture and demand often outran supply. 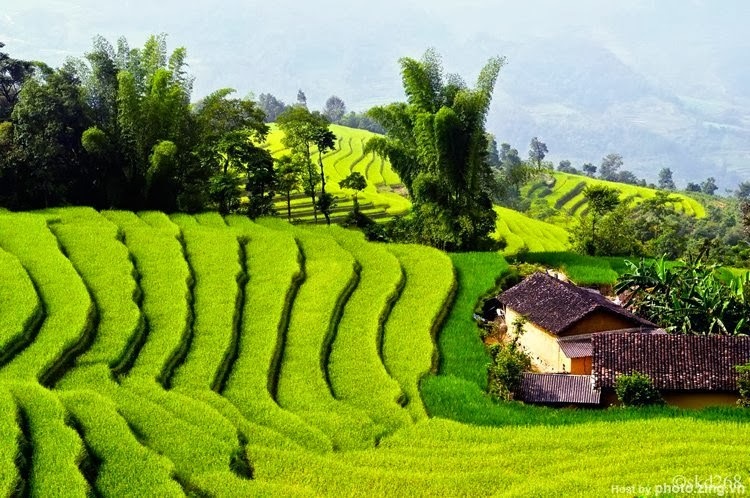 Cereal crops were especially hard hit and food like phở (soup with flat noodles) and bún (round rice noodles) and nem(spring rolls) sometimes disappeared from kitchens and markets. Coffee was also in very short supply, domestic consumers having to make do with tiny amounts of broken and second-rate coffee beans. The best coffee, though also in short supply, had to be saved for export. When the war ended in 1975, some of the hardship was relieved, but conditions were still difficult and recovery from the effects of war slow. 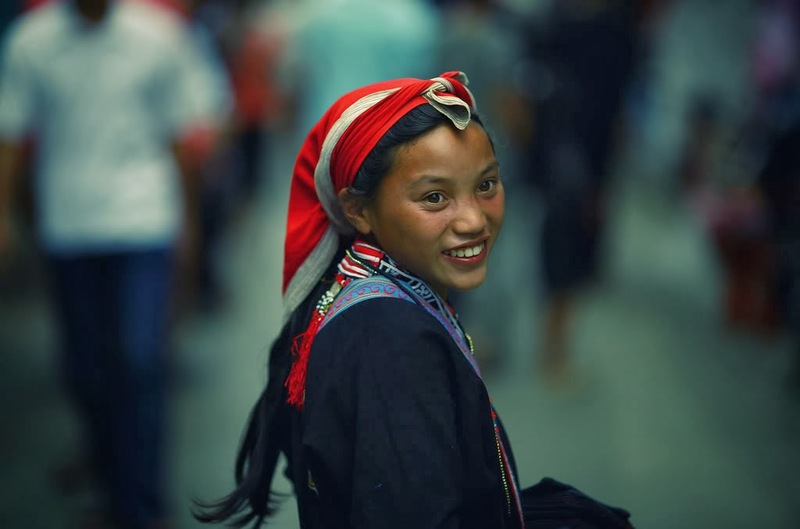 The year 1986 opened a new period known as đổi mới and during the past 15 years the Vietnamese economy has experienced strong growth and the living standard of the Vietnamese people has improved considerably. Tea shops and cafés are common in every street. Now, almost any kind of coffee or tea are available, from Arabian coffee, Trung Nguyên, Buôn Ma Thuột to Thái Nguyên as well as both English and French tea. Read more about Hanoi - a yellow mustard blossoming season. Việt Nam, barely able to feed itself during the war, has become the second largest exporter of rice in the world. Food and cereal are now abundant. Some 3.5–4 million tons of rice are exported annually. As a matter of course, many kinds of food and drinks from local specialties to popular snacks, have recovered their former places on Vietnamese menus. Vòng young sticky rice, for one, has made its way back after almost disappearing during the dark days of the war. Indeed, many of the popular old dishes are being updated and given a modern twist. Given the many exchanges within the Southeast Asia region and the world, the wealth of Vietnamese gastronomy is being further enriched by imported ingredients and experience with foreign dishes. Many restaurants and hotels now have Russian, Indian or French chefs, serving almost every kind of dishes, from common to luxurious. In the five-star Métropole Sofitel Hotel, there is a corner of street gastronomy called “Spicy Garden”, resembling a culinary Hà Nội in miniature and serving many of the dishes available along Hà Nội’s streets and in its alleys. In any event, one can now eat snails from a street vendor on one street, turn a corner and, entering a trendy café, sit down to a chicken Ceasar salad wrapped in pita bread! 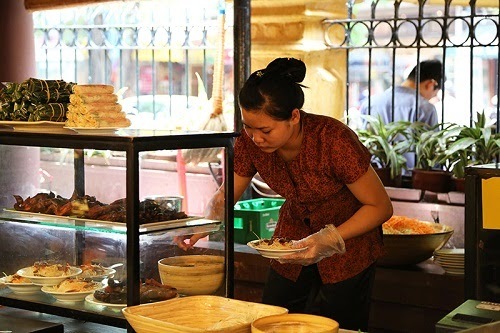 But the real joys of Hà Nội cookery are to be found in the little restaurants owned by natives of the city, many of which specialize in one or two specific foods. 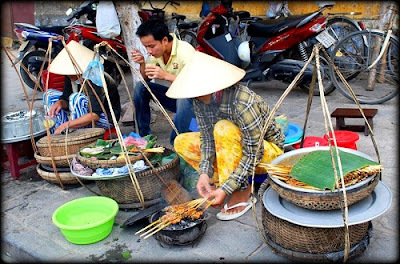 Hà Nội’s phở and bún clearly show their vitality as well – from early in the morning till late at night, numerous kinds of bún, ranging from those served with bamboo shoots to those with ribs, crab paste or grilled meat can be easily found. Some entire streets limit themselves to a particular specialty. These streets of food and drink such as Hàng Bông, Lê Văn Hưu, Mai Hắc Đế, Nam Ngư, Tông Đản, Hàng Giấy and many others are becoming very common – people seem to enjoy eating amid the hustle and bustle of traffic and shopping. 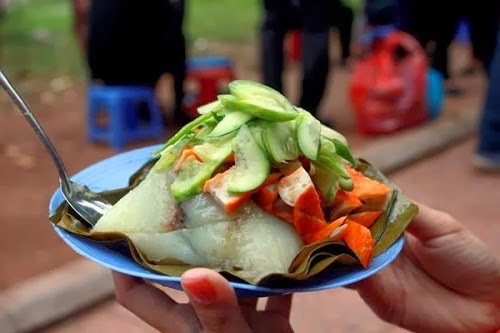 Hàng Than Street at present boasts over ten shops producing and selling bánh cốm (young sticky rice cake). 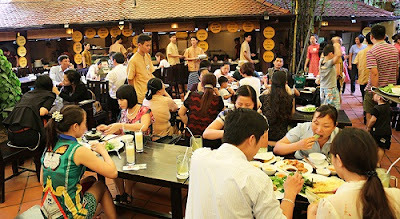 Eating out is a good way to experience some of what is unique about Hà Nội. On a rainy and cold afternoon, one may come to Chả Cá Restaurant in the old quarter to eat chả cá and sip a cup of rice liquor, immersing one’s soul in the atmosphere of old Hà Nội. 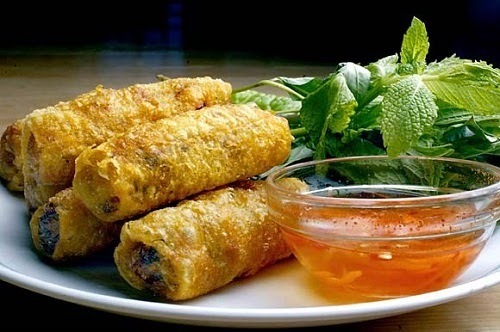 Or on a windy late summer afternoon, one may wish to go to Thanh Niên Road, the narrow causeway that divides Hồ Tây (West Lake) from Trúc Bạch Lake, to watch the moon rise and taste West Lake shrimp cake, a delicacy combining many flavors - sour, sweet and hot – which make it easy on one’s stomach. 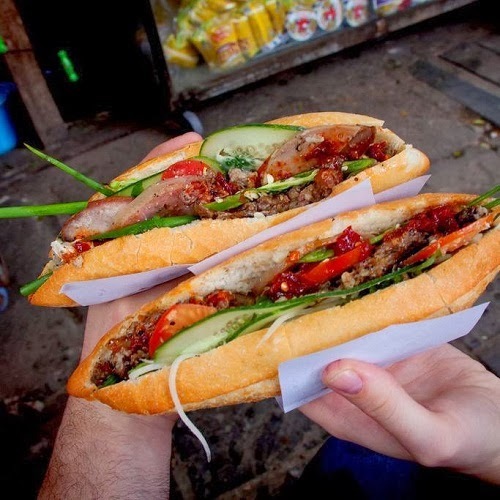 Those who like fast food or traditional dishes come to Hàng Hành Alley or Đinh Liệt Street. There, one has a wide range of choices, from bread with beef-steak, crisps to hot rice noodle soup. Huế Street and the far end of Mai Hắc Đế Street are home to sủi cảo, a kind of pasta. To taste a bowl ofphở bò (flat rice noodle soup with beef), go to Lý Quốc Sư, Lò Đúc, or Nguyễn Du Street. Now that economic renovation is progressing it can be said with confidence that Hà Nội’s traditional foods have made a strong comeback, while being joined by new variations on old themes as well as completely new dishes imported from abroad. Though fancy and expensive dishes are again available in the capital city, many of the best and most characteristic foods remain downright cheap. Any time of the day, rich or poor, you can find a filling delicious meal in five hundred different places in Hà Nội. The problem is no longer scarcity, but abundance – where to begin? What to taste first?